The summer is getting shorter and shorter, as are the weekends! My girls don’t start school for a few more weeks, but they are very excited about it. Have your kids started school yet? 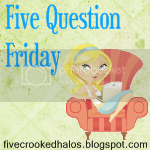 Let’s do a little Five Question Friday fun! Be sure and share your answers in the comments below! What is on your Summer 2013 bucket list? Is it terrible that I don’t even have a list? Or even any wishes? I am pretty excited that we were able to take the girls to the beach – that was a lot of fun! What is the most useless item on your child’s back to school list? My girls don’t even start school until August 27th (doesn’t that seem late? ), so we haven’t even gotten a list yet! This weekend is tax-free weekend here in Florida, so I wish I had a list already! My niece’s list has 5 dozen #2 pencils. FIVE dozen. Seriously?! What is the one reality TV show that makes no sense to you? How about anything to do with Bret Michaels from Poison. Or anything that is shown on VH1. Or anything involving Dr. Drew. Actually, how about all of them except for Top Chef. That’s my favorite. What is one movie you can watch over and over again? Why? Any Disney movie. I love them all. My absolute favorite though is Beauty & the Beast. It never gets old to me. What is your favorite back to school tradition? We only have one back to school season under our belts, this year will be number two. Last year, I dropped the girls off at school and then came home and got back in my jammies and took a nap. I think I’m going to do the same again this year.